Dec. 2014 Update: After extensive testing, I finally posted my hands-on review of the Vitamix S30. See that page for many more details about the pros and cons of the S30. 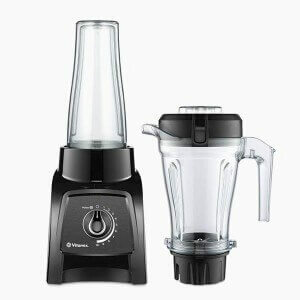 Vitamix just released a new model: the Vitamix S30. This is the most radically new Vitamix introduction since the early 90’s when they released the model that, with a few tweaks, became today’s 5200. The S30 seems to be inspired by the Magic Bullet/ Nutribullet: it is a compact size that makes one or two servings, and it has a blending container that doubles as a smoothie cup. It seems Vitamix is responding to the idea that the traditional Vitamix models are overkill for some home kitchens. I personally enjoy having the glorious power of a Vitamix 7500, and I don’t mind the space it takes up on the counter, but I can see how a slightly more compact machine would be appealing. The S30 comes with two blending containers: a 40-oz container that is the same style as traditional Vitamix containers with vented lid and tamper, and a 20-oz on-the-go smoothie container that you can drink out of. The 20-oz container is insulated with a double-walled construction so your smoothie stays cool longer. The lack of venting and tamper on the 20-oz container mean that it is not suitable for blending hot items (steam cannot safely escape), and it is also not suitable for blending thick items that would require the tamper (such as nut butter, sorbet, or hummus). When blending with the 20-oz container you will need to make sure that there is enough liquid to allow the ingredients to easily circulate. Unlike all other Vitamix models, the blade assembly on the S30 is designed to easily unscrew from the container, which is what allows the 20-oz on-the-go container to work. The 20-oz container also has a travel-friendly sealing flip-top lid, and its bottom fits standard cup holders. Also unlike all other Vitamix containers, the S30 containers are officially approved for use in the dishwasher. Cleaning the other Vitamix containers is generally extremely quick, but I can see how the on-the-go container could save a few precious moments if you are in a rush to get out the door in the morning. Note that because of the new design, these containers are only compatible with the S30. They are not compatible with other Vitamix models. To go with its smaller size, the Vitamix S30 has a smaller motor than its bigger siblings. The S30 motor is rated for 790 watts, compared with 1380 and 1440 watts for the other Vitamix models. Smaller blending volumes require less power, but I wonder how the S30 will do with hard/fibrous ingredients. The other Vitamix models make smooth work of hard ingredients like whole nuts, kale stalks, and carrots. We will need to test the S30 to see how it handles these types of ingredients. I am a bit surprised by the price-point of the S30. At $409, it is more than the Classic Two Speed, and barely less than the Classic Variable Speed (aka 5200). If you are concerned about price, you should look at the Certified Reconditioned models, which start at $299. The S30 has a 5-year warranty, which is the same as the Certified Reconditioned models, and 2 years less than the 7-year warranty on most of the other new Vitamix models. There are some other new Vitamix models that come with a 5-year warranty: the Two Speed, the 6000, and the Creations series. Is the Vitamix S30 worth buying? If you typically only prepare food for 1–2 people and are put off by the size of the other models then the S30 is worth considering. The on-the-go container should be useful for some people. However, I would personally choose a certified reconditioned 5200 or 7500 (for a full description of all the other Vitamix models, see my Vitamix comparison page). Having owned three Vita-Mixer over the last 25 years I can say I’m sorely disappointed in the route the company has and is taking. Too many different models, specialty models for companies like QVC and Sonoma Williams just to mention two and reducing their warranty by two years which they didn’t do in the past. This new individual model, in my opinion is grossly over-priced. Interesting. I was wishing that VitaMix would come up with some sort of mini container that could blend my green smoothies quick and easy like my Magic Bullet. The Magic Bullet is not powerful enough to blend the fruits or greens like my VM. But I can get the Nutribullet for $99; much easier on the wallet than $400. And I just upgraded my VM about 6 months ago, so shelling out another $400 isn’t very appealing. I got all excited to see the S30 until I realized it was a completely different machine. I love Vitamix Company and products. 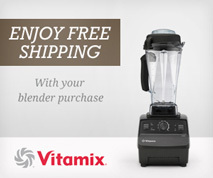 I thought it was offering an adapter and container for the original Vitamix machine. My thoughts are that you would have had much better sales if this were an adaptable to current Vitamix machines. I’d be willing to shell out 100.00+ just for the adapter and container. Maybe not feasible from your standpoint, but I think your many loyal customers would gladly follow as well as catching the eye of new customers. Totally agree with Satori3581 An on-the-go smoothie container of a small size would be a VERY useful add-on to the standard VM. I like the power of my VM (5200) and it makes excellent blends, yet if the smaller/portable containers were available it would make it even more useful. Making smaller quantities before leaving home and taking it on the go without much hassle – something many of us will probably appreciate. Personally, I would not consider buying a separate blender for that, but would gladly buy such an attachment and use it daily. This seems very much overpriced. I’m let down and disappointed in seeing this. Why not just stick to full sized commercial equipment? There is no need to compete with nutribullet in any way! Geez! I only have 16″ cabinet clearance on my counter so S30 is appealing. My concern, due to diverticulitis, does it pulverize seeds completely? I’ll reserve judgements until there’s a performance comparison to the Nutribullet and with which other machines the S30 is meant to compete. I have owned a Nutribullet for about 5 months. It began spewing a dark rust-brown thick goop from the blade assembly about a month ago. A quick look online, and I discovered this is a defective product – many, many people have posted about this issue online. The rust enters into the food being blended. Convenient and easy on the pocketbook? Yes. Safe? NO! I just ordered mine… I’m super excited and can’t wait to receive it. I purchased my 7500 last summer and I love it… I hope I’m not disappointed by the s30. I returned my 900watt nutribullet because consumer reports just released a report where they found the blades to be defective.